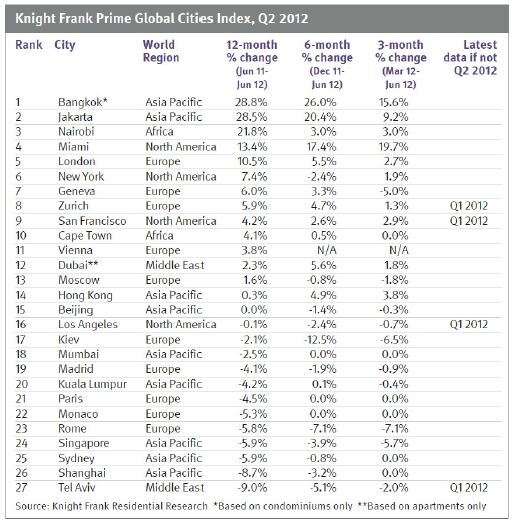 Since its low in Q2 2009 the Prime Global Cities Index – which tracks the performance of the top 5% of mainstream housing markets – has been largely subdued, recording average quarterly growth of 0.8%. The buoyant Asian markets kept the index in positive territory up until Q1 2012 when cooling measures and in particular restrictions on second-home ownership, led to a fall of 0.4% in the first quarter of 2012. That said, Asia and Europe have proved critical to the index’s recovery in the second quarter. Prime prices in Asia rose by 3.4% in the year to June, the equivalent figure in March was -2.5%. Similarly, prime prices in Europe rose by 1.3% in the year to June, an improvement on the -3.4% recorded in the year to March. Asia’s resurgence in the second quarter can largely be attributed to the strong performance of its emerging markets, namely Jakarta and Bangkok, rather than its traditional powerhouses of Singapore and Hong Kong. The growth in Europe’s prime prices has taken place despite – or possibly because of – the deepening Eurozone crisis. With the prospect of more bailouts looking increasingly likely, prime buyers and investors seem to have separated European cities into different tiers. Buyers and investors are no longer just concentrating on those cities that attract a high level of international demand and a good quality of life but the latest results suggest they are increasingly seeking prime property in those cities best sheltered from the EU debt debacle. London, Geneva, and Zurich are all positioned in the top half of the Q2 results table having recorded annual price growth of 10.5%, 6.0%, and 5.9% respectively. Despite the positive results in Q2, the overall outlook for the world’s prime markets is muted. We are unlikely to see significant sustained growth given the numerous downside risks facing the global economy. Europe’s economic frailty together with the introduction of more protectionist measures in Asia (aimed at improving affordability for domestic buyers), is expected to inhibit price inflation within both the mainstream and prime markets for the remainder of 2012.